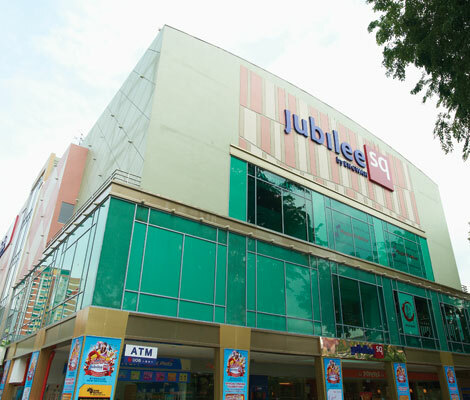 Located in the quintessential town centre of Ang Mo Kio, Jubilee Square is a concept mall situated in the heart of Singapore’s most established districts. Jubilee Square is owned and managed by Eng Wah Global Pte Ltd.
Jubilee Square is a four-level development totaling approximately 30,000 square feet of commercial space with nearly 30 outlets offering tantalizing F&B, exciting lifestyle brands and more. Formerly known as Jubilee Entertainment Complex, the newly revamped Jubilee Square is a well-established destination for education, shopping, dining, wellness, and lifestyle needs. Founded in 1946, the Eng Wah Group’s business spans entertainment, properties, hospitality, and lifestyle in Singapore and Malaysia. The Group manages a portfolio of brands that include WE Cinemas, Hotel Fort Canning, Jubilee Square, 321 Clementi, and The Legends Fort Canning Park. Click here to go to Eng Wah Global website. Best viewed in latest version of Chrome, Safari or Firefox or Internet Explorer (9 and above). © 2019 Eng Wah Global Pte Ltd. All Rights Reserved.